Stems: Sprawling and trailing, much-branched, bearing axillary tendrils. Leaves: Alternate: petiole .4 to 1.8 inch; blade pentagonal to broadly ovate in outline, 1-2-ternately compound; leaflets ovate-lanceolate to rhombic-lanceolate or narrowly lanceolate, primary leaflets .4 to 3 inches, base wedge-shaped, margins coarsely toothed or lobed, tip acuminate. Inflorescences: Axillary, panicles, 3-11-flowered; peduncles 1 to 2.4 inches. Flowers: Sepal lobes 4, unequal, 2 large ones opposite, .1 to .14 inch, 2 small ones opposite, to .06 inch; petals 4, distinct, slightly unequal, white, obovate, .1 to .14 inch, each with petaloid appendage at base; stamens 8; style 1; stigma 3-lobed. Fruits: Capsules bladdery-inflated, 3-lobed, 1 to 1.6 by 1.1 to 1.2 inch. ; seeds 3, globose, black, shiny, ca. .2 inch; aril light gray or white, heart- or kidney-shaped. Habitat: Moist thickets, riverbanks, fields, and waste places. 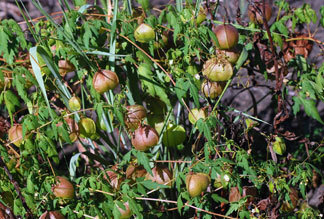 Comments: Cardiospermum halicacabum occasionally is grown as a trellis plant for its foliage and fruits. Cardiospermum alludes to the heart-shaped aril on the seed.